Your Aitkin area Old Hickory Buildings Show Lot! 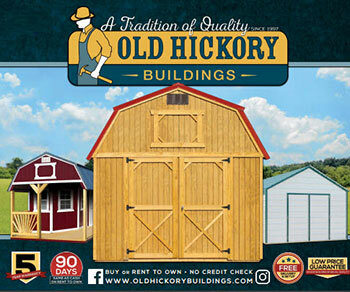 With over 500 locations in North America, a huge variety of buildings and options to choose from, and an inventory of over 10,000 buildings in stock and ready to deliver, you’re sure to get the building you need, when you need it. Our professional, on-site sales people will help guide you through the buying process using our advanced computer order system. Our sleek, modern system leaves no room for error with every custom order being drawn to scale and, with a full 3d rendering of the building, you can see a representation of what your building will look like before you purchase. Not sure how you want to customize your building? Browse through our extensive galleries of photos here, or check out our Facebook and Instagram pages for ideas.